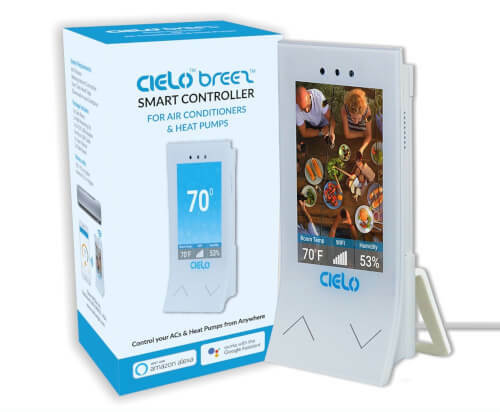 Cielo Breez is a plug & play smart air conditioner controller. It’s simple to install. You can hang it on the wall or place it on a table in AC / Heat Pump's line of sight. Breez directly connects to your home Wi-Fi router and controls your air conditioner through IR signals. Download "Cielo Home" app and register your device. No additional hub or wiring is needed. For remote control compatibility click the link here. Cielo Breez lets you control your air conditioners and heat pumps through a smartphone from anywhere in the world. It helps you save up to 25% on your energy bills. Cielo Breez is compatible with Amazon Alexa and the Google Assistant. Just refer to Alexa and say; “Alexa, Power On Bedroom” or to the Google Assistant saying; "Hey Google, Power on the Bedroom" and it will be done. Lower Bills: You can save up to 25% on your energy bills by using various features of Breez Air Conditioner Controller. Zone Control: Single touch control for all your Ductless ACs & Heat Pumps by creating zones. Weekly Scheduling: Cielo Breez provides a powerful scheduling functionality where you can schedule your ACs / Heat Pumps as per desired settings and time. Air Filter Status:Clean air filter keeps you healthy and reduces energy bills. Breez tracks air filter status and reminds you when it needs cleaning. Location based Control: Location based control triggers air conditioner functions based on your location. You can define the geo-fencing to trigger actions of your choice. Usage Statistics: It provides complete usage audit of connected ACs on "Cielo Home" App keeping you aware of your usage patterns and helps you achieve your saving goals. Cielo Breez works with Amazon Alexa and the Google Assistant. Managing your ACs and Heat Pumps is possible with simple voice commands. Just refer to Alexa and say; “Alexa, Power On Bedroom” or to the Google Assistant and say; "Hey Google, Power on the Bedroom" and it will be done.